Arbor Day: Our city staff, along with volunteers from Lorne Akins pulled off another fantastic Arbor Day celebration with a crowd of St. Albert's grade-1 students. I was honoured to greet them on behalf of Council, and tell them about my favourite trees, Maples and Cinnamon! 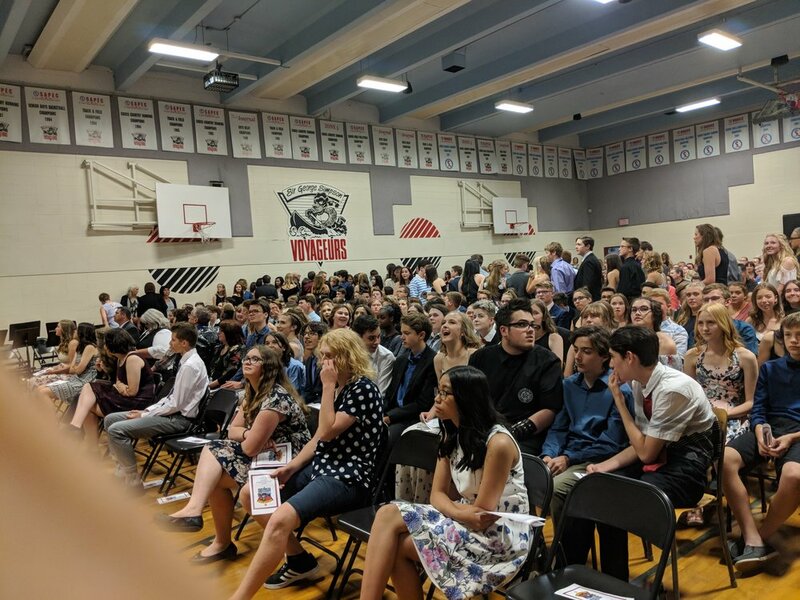 Sir George Simpson celebration: Thanks to the students at SGS for allowing me to join them on behalf of Council to celebrate the end of their junior high years! These students will almost all be 18 in time for the next municipal election in 2021, so I challenged them to beat the record for youngest city councillor! This is a repeat of my overview for the May 28 meeting - We decided that it should come to GPFC for discussion before being considered for approval by Council. Again, just a repeat to see this in the appropriate format. while travelling on a sidewalk that is at least 5 metres away from: a(n) doorway, window, or air intake of a building; a patio; a park; and St. Albert Place, transit centers, recreational facilities (including all outdoor pools, spray parks, playgrounds, seasonal skating rinks, skate parks, sports fields, arenas, courts, and recreation centres), fire halls, recycle yards, police stations, and civic work places." Interestingly, Lois Hole Park is excluded because it's a provincial park, so it looks like smoking (anything) will still be allowed there regardless of municipal bylaws. The Smoking Bylaw amendments being recommended if the consumption bylaw goes through include tossing all the Council direction regarding further limiting where tobacco/other products can be smoked, and removing references to cannabis from the bylaw (since cannabis is handled separately). As far as I can tell, it would also mean that smoking/vaping something other than tobacco/cannabis would become unrestricted. The only new items include "In reaction to... possible negative impacts on the immediate area surrounding cannabis retail stores (e.g., noise complaints regarding a cannabis retail store that chooses to stay open until 2:00AM <or> the production of any generally offensive odours; or... the generation of unreasonably loud, raucous or unusual noise which annoys, disturbs, or detracts from the comfort, repose or peace of any other person of ordinary sensitivity", we could include provisions that would allow Administration to restrict business hours (10am-10pm) or require that cannabis has to be kept sealed inside the offending store.